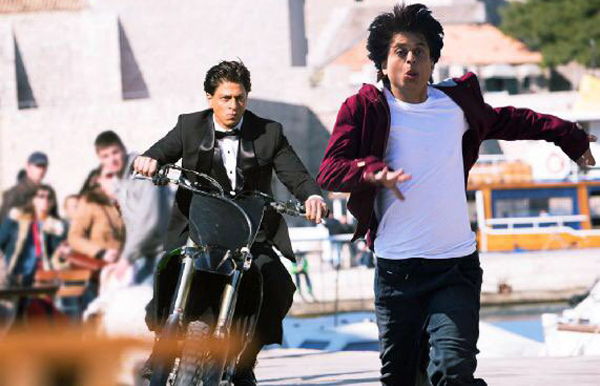 King Khan- Shah Rukh Khan’s upcoming movie 'Fan' has become the most awaited movie of the year. The movie revolves around character Gaurav (Shah Rukh Khan), whose world revolves around Aryan Khanna (Shah Rukh Khan). This young Gaurav goes on a journey from Delhi to Mumbai, in order to wish his idol on his birthday. Things don't go according to plan and his love turns into a dangerous obsession. Gaurav then wants to harm Aryan and thereafter a star chases his fan. SRK recently took to twitter and shared a pic saying, "I hope I catch up with me one day...or not. But will keep trying. "Ab Star Fan ke peeche bhaagega!!!" Even during the launch of his trailer, SRK said: "I won't say it was easy because I was playing a movie star, the way I do in real life. So, it doesn't take you away from the real world. Maneesh and the whole team had a great understanding of how Gaurav was. 50 percent of what you see in Gaurav is a physical transformation-- prosthetics and VFX have been used. 100 per cent Gaurav is Maneesh's vision." This movie 'Fan' will hit screen on April 15, 2016.